K-9 Angels Rescue is part of the Kroger Neighbor to Neighbor Donation program. Each year, Kroger donates $1 million annually to enrolled organizations. If you enrolled your card last year, YOU STILL HAVE TO ENROLL IT AGAIN THIS YEAR. Then whenever you shop at Kroger, a portion of your total bill is donated to our organization. There is no cost to you at all! 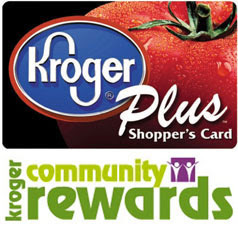 Please enroll your Kroger Card in the Kroger Community Rewards Program. Choose a Houston store location and select K-9 Angels Rescue as your organization to support. Once enrolled, a percentage of the amount you spend will be donated to us from Kroger at year end. Our NPO number is WB125. Don't delay! ENROLL YOUR CARD NOW by clicking HERE and following the directions. If you do not have a card, you can get one inside a Kroger store or enroll online for an account by using your phone number (you won't get a physical card if you enroll online). Our NPO number is WB125. If you use your phone number at Kroger's checkout instead of swiping a card, you can call 1-800-576-4377 (select option 4) to get your card number. Please encourage your friends and family to enroll as well.